The idyllic Isle of Man is situated in the Irish Sea between England, Scotland, Ireland and Wales. Less than 60 miles west of the Lancashire coast line, largely calm conditions make Isle of Man ferry connections from Ireland and the UK straightforward. Although draped in wonderful landscapes, the island's main tourist draw is the Isle of Man TT motorcycle races that run during the first two weeks of June. This festival of frenzy draws motorcycle fanatics from all corners of the world. The Island has escaped the mass tourist trade and maintains a tranquil atmosphere for most of the year. Enjoy walks around the unspoilt hundred mile coast line, find a picturesque picnic spot, roam through rural villages and sit on steam trains. Travel to the Isle of Man is extremely simple with Direct Ferries. The island is perfectly placed for ferry travel with connections offered from England, Ireland and Northern Ireland. Douglas Harbour is the entrance point for all passenger ferries travelling to the island. If travelling from England you depart from Liverpool, Liverpool Birkenhead and Heysham. Liverpool typically boasts the most frequent services with the shortest crossing time at around two and three quarter hours. 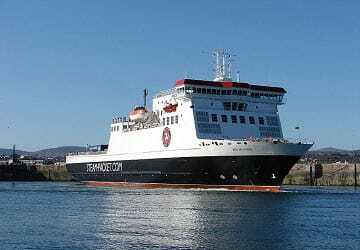 Throughout the year, the Isle of Man Steam Packet also operates sailings from Belfast in Northern Ireland and crossings from Dublin. The Isle of Man Steam Packet service operates up to 30 sailings a week, with crossings made daily. There are frequent sailings from Douglas to Heysham and Liverpool, journeys to Liverpool Birkenhead, Belfast and Dublin are limited to a couple a week. For the full timetable, use our search tool to see which times and dates suit you. 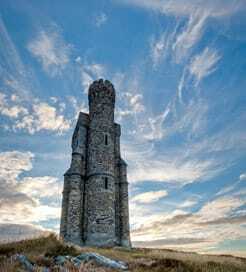 The Isle of Man is one of the most beautiful spots in Britain, a mountainous, cliff-fringed island just thirty-one miles by thirteen, into which are shoehorned austere moor lands and wooded glens, sandy beaches, fine castles, beguiling narrow-gauge railways and scores of standing stones and Celtic crosses. One person in our little family group is afraid of anything that sits on water and she was not looking forward to the crossing. Imagine how delighted she was to find helpful staff, good seating arrangements and enough going on around her to make the journey a great experience. Fares very good value and a pleasant way to begin a holiday. "trip to douglas from liverpool on Manannan"
The smooth fast trip was a delight. perfect conditions on the sea and aboard. Good food and lounge seating .booking the trip was easy on line , the back up emails and the attention to detail was reassuring. I would travel again on the Manannan. For more information, please visit our Ferries from Northern Ireland to Isle of Man page. For more information, please visit our Ferries from Ireland to Isle of Man page.